A flowering plant that grows to 3 feet in The Everglades, as well as other marshes, bogs, perimeter of lakes and streams from Nova Scotia to Florida and Texas. The seeds can be eaten raw or cooked. They’re said to have a nutty flavor and texture when eaten raw. The young leaves can be utilized in salads, or boiled briefly and served with butter. Manatees are reported to eat pickerel weed, favor it over many aquatic plants. Gotta be over 12 feet, I thought. The gnarled black head was far too long for a regular bull alligator. I tightened my grip, wondered how aggressive this one would be. Enough to charge? 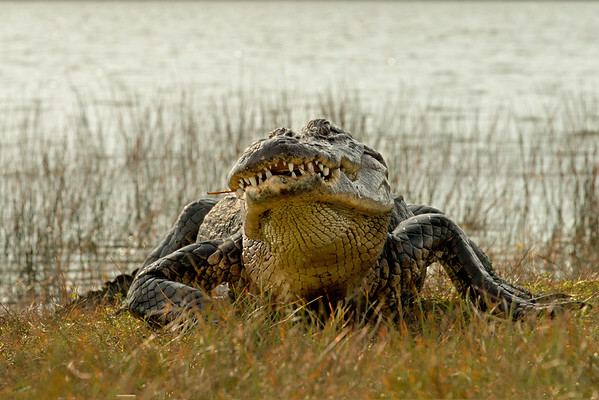 As it slid out of the water onto the beach it stood on all fours and walked, high-walked, a term my mind used when big gators stood up to walk versus the usual, and far more humble, crawl. Once on the grass it flopped down, yellow white belly retreating beneath a water glistened black hide. I exhaled, squeezed clammy hands and then walked an imaginary diagonal line to position myself in front of the monster. With about 25 feet between us I strained peripheral vision while not making eye contact, and lowered myself to the grass, reached forward with my free hand and slid down onto my belly also. We were head to head. I depressed the shutter several times.